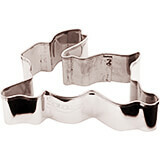 Commercial grade metal cookie cutters made of stainless steel or tinplate are extremely durable and dependable. Available in many shapes and sizes to make beautiful cookies for your next event. 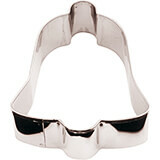 Sapphire shape (triangular with rounded sides) pastry cutter. 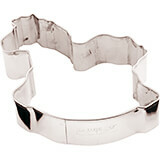 Stainless steel cutters, with reinforced body. 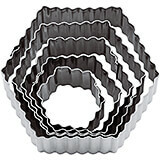 Specially designed for cutting biscuits meant to be used as bases for individual cakes formed in Flexipan®. 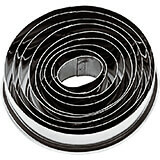 To be used with Matfer Bourgeat's Flexipan mold #336469. 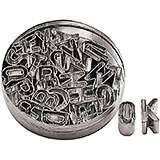 This is a 26 piece Paderno World Cuisine set of alphabet dough cutters. Commercial grade pastry and cookie cutters with sharp edges for cutting dough, craft clay, soft fruits and more into a particular shape. 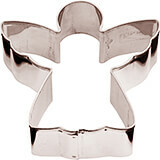 Stainless Steel Angel Cookie Cutter, 2.75"
2.75" X 2.75" X 1.125"
The Paderno World Cuisine stainless steel "angel" cookie cutter has sharp edges for precise cutting and is professional quality. It is dishwasher safe and extremely durable. This is a 10 piece Paderno World Cuisine set of animals dough cutters. Commercial grade pastry and cookie cutters with sharp edges for cutting dough, craft clay, soft fruits and more into a particular shape. Stainless Steel Bell Cookie Cutter, 2.38"
2.375" X 2.75" X 1.125"
The Paderno World Cuisine stainless steel "bell" cookie cutter has sharp edges for precise cutting and is professional quality. It is dishwasher safe and extremely durable. 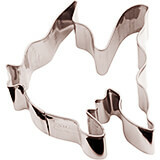 Stainless Steel Bunny Cookie Cutter, 3.13"
3.125" X 2" X 1.125"
The Paderno World Cuisine stainless steel "bunny" cookie cutter has sharp edges for precise cutting and is professional quality. It is dishwasher safe and extremely durable. 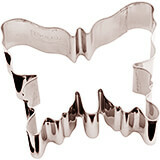 Stainless Steel Butterfly Cookie Cutter, 3.13"
3.125" X 2.75" X 1.125"
The Paderno World Cuisine stainless steel "butterfly" cookie cutter has sharp edges for precise cutting and is professional quality. It is dishwasher safe and extremely durable. 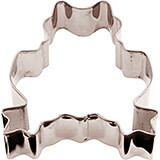 Stainless Steel Carnation Pastry / Cookie Cutter, 5"
Round Fluted Pastry Cutter. Round Fluted sides will cut your cookies or pastry in the shape of carnations. Made of stainless steel. Measurements: 5" Diam. Weight: 6 oz. 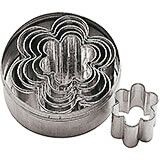 Stainless Steel Carnation Pastry / Cookie Cutter, 5.5"
Round Fluted Pastry Cutter. Round Fluted sides will cut your cookies or pastry in the shape of carnations. Made of stainless steel. Measurements: 5 1/2" Diam. Weight: 6 oz. 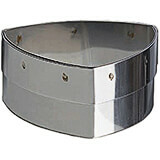 Stainless Steel Carnation Pastry / Cookie Cutter, 6"
Round Fluted Pastry Cutter. Round Fluted sides will cut your cookies or pastry in the shape of carnations. Made of stainless steel. Measurements: 6" Diam. Weight: 6 oz. 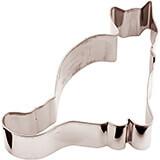 Stainless Steel Cat Cookie Cutter, 3.13"
3.125" X 3.125" X 1.125"
The Paderno World Cuisine stainless steel "cat" cookie cutter has sharp edges for precise cutting and is professional quality. It is dishwasher safe and extremely durable. 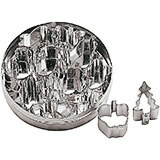 This is a 7 piece Paderno World Cuisine set of Christmas dough cutters. 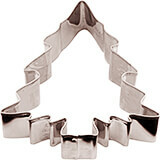 Stainless Steel Christmas Tree Cookie Cutter, 3.13"
The Paderno World Cuisine stainless steel "Christmas tree" cookie cutter has sharp edges for precise cutting and is professional quality. It is dishwasher safe and extremely durable. 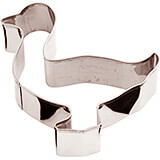 Stainless Steel Comet Cookie Cutter, 3.13"
3.125" X 1.625" X 1.125"
The Paderno World Cuisine stainless steel "comet" cookie cutter has sharp edges for precise cutting and is professional quality. It is dishwasher safe and extremely durable. Flexipan&Reg; Double Hearts Cutter. 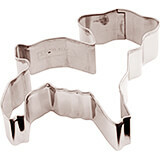 Pastry and Cookie cutters are metal molds with sharp edges for cutting dough into a particular shape. 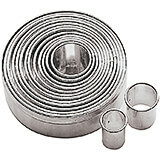 Stainless steel cutters, with reinforced body. 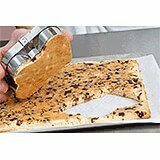 Specially designed for cutting biscuits meant to be used as bases for individual cakes formed in Flexipan®. For molds #336391. 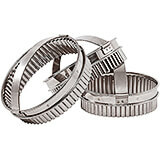 Made of heavy duty stainless steel 18/10. 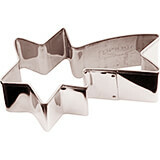 Triangle shaped dough cutter, great for Shortbread. Measurements: 3 1/2" L x 1 1/2" H. Weight: 3 oz. 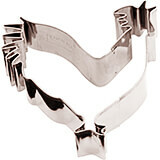 Stainless Steel Dove Cookie Cutter, 3.13"
The Paderno World Cuisine stainless steel "dove" cookie cutter has sharp edges for precise cutting and is professional quality. It is dishwasher safe and extremely durable. This is a 6 piece Paderno World Cuisine set of Easter dough cutters. Stainless Steel Fish Cookie Cutter, 3.13"
The Paderno World Cuisine stainless steel "fish" cookie cutter has sharp edges for precise cutting and is professional quality. It is dishwasher safe and extremely durable. 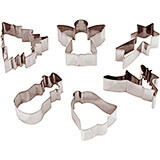 This is a 6 piece Paderno World Cuisine set of flower dough cutters. Commercial grade pastry and cookie cutters with sharp edges for cutting dough, craft clay, soft fruits and more into a particular shape. 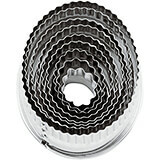 This is a 5 piece Paderno World Cuisine set of fluted hexagon dough cutters. 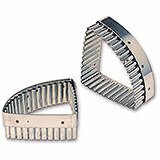 Commercial grade pastry and cookie cutters with sharp edges for cutting dough, craft clay, soft fruits and more into a particular shape. 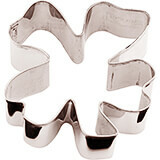 Stainless Steel Four-leaf Clover Cookie Cutter, 3.13"
The Paderno World Cuisine stainless steel "four-leaf clover" cookie cutter has sharp edges for precise cutting and is professional quality. It is dishwasher safe and extremely durable. 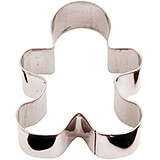 Stainless Steel Frog Cookie Cutter, 3.13"
This is a 12 piece Paderno World Cuisine set of fruit dough cutters. 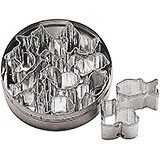 This is a 12 piece Paderno World Cuisine set of geo shapes dough cutters. Commercial grade pastry and cookie cutters with sharp edges for cutting dough, craft clay, soft fruits and more into a particular shape. Stainless Steel Geometric Shapes Dough Cutter, 12 Assorted Pieces, 1"
This is a 12 piece Paderno World Cuisine set of geometric shapes dough cutters with the average shape of each cutter 1 inches in diameter. 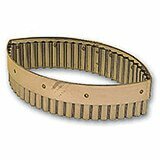 Each cutter produces a cut of an average of 1 inch in diameter or height. Commercial grade pastry and cookie cutters with sharp edges for cutting dough, craft clay, soft fruits and more into a particular shape. 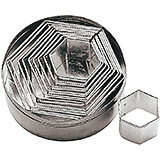 Stainless Steel Geometric Shapes Dough Cutter, 12 Assorted Pieces, 1/4"
This is a 12 piece Paderno World Cuisine set of 1/4" diameter geometric shapes dough cutters. Commercial grade pastry and cookie cutters with sharp edges for cutting dough, craft clay, soft fruits and more into a particular shape. 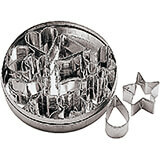 Stainless Steel Geometric Shapes Dough Cutter, 12 Assorted Pieces, 3/8"
This is a 12 piece Paderno World Cuisine set of 3/8" diameter geometric shapes dough cutters. Commercial grade pastry and cookie cutters with sharp edges for cutting dough, craft clay, soft fruits and more into a particular shape. 2.375" X 3.125" X 1.125"
The Paderno World Cuisine stainless steel "gingerbread man" cookie cutter has sharp edges for precise cutting and is professional quality. It is dishwasher safe and extremely durable. 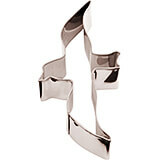 Stainless Steel Goose Cookie Cutter, 3.13"
The Paderno World Cuisine stainless steel "goose" cookie cutter has sharp edges for precise cutting and is professional quality. It is dishwasher safe and extremely durable. 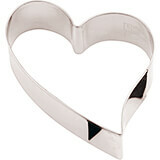 Stainless Steel Heart Cookie Cutter, 3.13"
3.125" X 3.5" X 1.125"
The Paderno World Cuisine stainless steel "heart" cookie cutter has sharp edges for precise cutting and is professional quality. It is dishwasher safe and extremely durable. 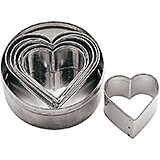 This is a 6 piece Paderno World Cuisine set of heart dough cutters. Commercial grade pastry and cookie cutters with sharp edges for cutting dough, craft clay, soft fruits and more into a particular shape. 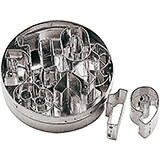 This is a 6 piece Paderno World Cuisine set of hexagon dough cutters. Commercial grade pastry and cookie cutters with sharp edges for cutting dough, craft clay, soft fruits and more into a particular shape. 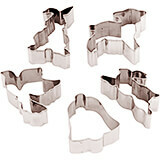 Stainless Steel Lamb Cookie Cutter, 3.13"
The Paderno World Cuisine stainless steel "lamb" cookie cutter has sharp edges for precise cutting and is professional quality. It is dishwasher safe and extremely durable. This is a 9 piece Paderno World Cuisine set of numbers dough cutters. Commercial grade pastry and cookie cutters with sharp edges for cutting dough, craft clay, soft fruits and more into a particular shape. This is a 9 piece Paderno World Cuisine set of oval fluted dough cutters. 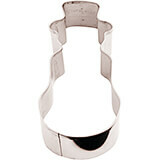 Stainless Steel Oval Fluted Pastry / Cookie Cutter, 6.25"
Oval Fluted Cutter. 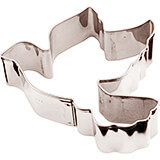 Pastry and Cookie cutters are metal molds with sharp edges for cutting dough into a particular shape. Made of stainless steel. Heavy duty, sharp and beveled. Fluted. Measurements: 6 1/4" L. Weight: 4 oz. 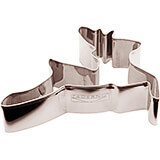 This is a 9 piece Paderno World Cuisine set of oval plain dough cutters. 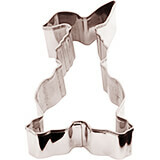 Stainless Steel Rabbit Cookie Cutter, 3.13"
The Paderno World Cuisine stainless steel "rabbit" cookie cutter has sharp edges for precise cutting and is professional quality. It is dishwasher safe and extremely durable. 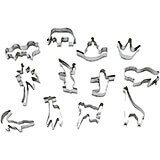 Stainless Steel Reindeer Cookie Cutter, 3.13"
Stainless Steel Rocking Horse Cookie Cutter, 3.13"
The Paderno World Cuisine stainless steel "rocking horse" cookie cutter has sharp edges for precise cutting and is professional quality. It is dishwasher safe and extremely durable. Stainless Steel Rooster Cookie Cutter, 3.13"
The Paderno World Cuisine stainless steel "rooster" cookie cutter has sharp edges for precise cutting and is professional quality. It is dishwasher safe and extremely durable. 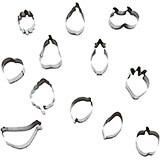 This is a 14 piece Paderno World Cuisine set of round plain dough cutters. Stainless Steel Seagull Cookie Cutter, 4.38"
4.375" X 2.375" X 1.125"
The Paderno World Cuisine stainless steel "seagull" cookie cutter has sharp edges for precise cutting and is professional quality. It is dishwasher safe and extremely durable. 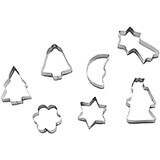 Stainless Steel Set Of 6 Assorted Christmas Cookie Cutters, 3.13"
The Paderno World Cuisine stainless steel set of 6 "Christmas" cookie cutters have sharp edges for precise cutting and are professional quality. They are dishwasher safe and extremely durable. 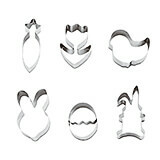 Stainless Steel Set Of 6 Assorted Easter Cookie Cutters, 3.13"
The Paderno World Cuisine stainless steel set of 6 "Easter" cookie cutters have sharp edges for precise cutting and are professional quality. They are dishwasher safe and extremely durable. Stainless Steel Snowman Cookie Cutter, 1.63"
1.625" X 3.125" X 1.125"
The Paderno World Cuisine stainless steel "snowman" cookie cutter has sharp edges for precise cutting and is professional quality. It is dishwasher safe and extremely durable.